It’s easy to get confused over financial terminology. Many people have heard of IRAs and money markets, but until you understand their purpose, you cannot take best advantage of all the benefits they offer. An IRA, or individual retirement account, functions differently than a money market investment and you should not confuse the two. Many people think of an IRA as an investment, but it’s probably more accurate to think of it as an empty bucket. Just like you can fill a bucket with water, sand or rocks, you can fill an IRA with any investment you choose. You can open an IRA account without writing a check. It functions as an account title that indicates tax-favored status to the Internal Revenue Service (IRS). A money market is one type of investment your can hold in your IRA bucket. If you choose to use a money market investment in your IRA, your check is deposited into the money market and your IRA statement lists the money market as an IRA holding. You can also hold stocks, bonds or mutual funds in your IRA bucket. Your investment time frame plays an important role in choosing appropriate investments. An IRA account intentionally spans your lifetime so you can accumulate funds to supplement retirement income. You deposit to it each year until you retire, and then you take money out of it for the next 20 to 25 years or until your death. If you withdraw from an IRA before you reach age 59½, the IRS slaps a 10 percent penalty on your withdrawal. All these features define an IRA as a long-term investment account. In contrast, money markets are liquid savings accounts that often include check-writing privileges. While they can average higher returns than regular savings accounts, they are considered low-risk accounts that do not have the growth potential of most stocks and mutual funds. Many investors use money markets to hold emergency cash, generally considered a short-term investment objective. IRAs allow you to save and invest without paying taxes. When you deposit to a traditional IRA you can deduct the contribution from your income tax and your earnings are not taxed until you take money out. If you use a money market to fund your IRA, the tax status of the IRA will shelter your money market investment from taxes, but the liquidity features of a money market will now fall under IRA tax rules. A money market in an IRA account is generally used to hold short-term cash that you use to purchase stocks, bonds or mutual funds within your IRA. A withdrawal to purchase a car, however, could generate taxes and penalties if you withdraw before age 59½. You can establish two types of IRAs and choose between two types of money markets. A bank money market account provides Federal Deposit Insurance Corp. (FDIC) insurance and generally pays higher interest rates that than regular savings accounts. Investment companies offer money market mutual funds that are not covered by FDIC. Money market funds invest in low-risk securities such as certificates of deposit and other short-term, liquid assets. They usually yield a higher return than a money market deposit account and allow you easy access to your cash. Money fund managers strive to maintain a dollar-for-dollar value on your deposit, but mutual funds carry no guarantees -- even for money market investments. 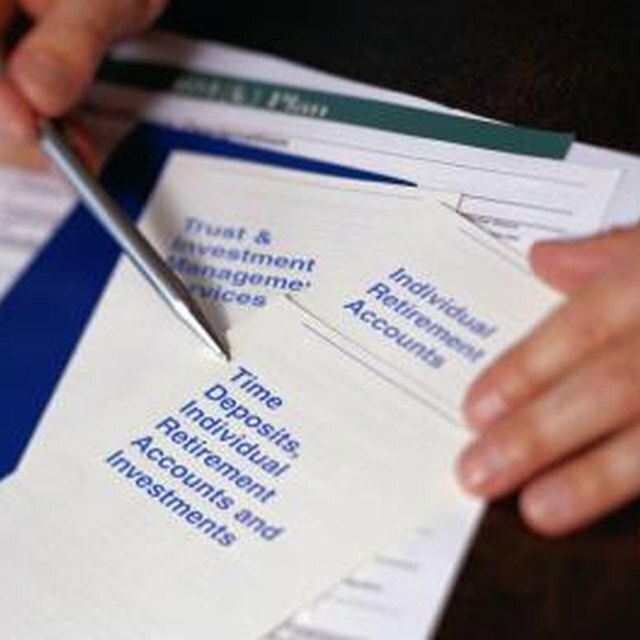 A traditional IRA allows you to deduct annual account contributions from your taxable income and defer taxes until you make withdrawals. You must begin taking a minimum withdrawal annually after age 70½. Roth IRAs allow you to contribute after-tax income into the account. Once in the account, earnings usually accumulate tax free unless you withdraw your earnings before age 59½. You can access your principal without taxes or penalty, and after 59½ you can withdraw any amount without paying taxes. Roth IRAs do not require minimum distributions. To open a Roth IRA you must not exceed IRS income guidelines.